WHAT IS THIS AIR HOCKEY ROBOT? 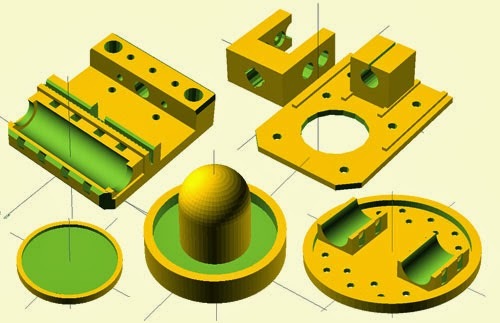 With the idea of using standard 3D printer parts : NEMA17 stepper motors, stepper motor drivers, the jjRobots Brain Shield, belts , bearings, rods, 3D printed pieces … we started to develop the project.The main advantage of using these parts is that they are inexpensive and easily available. We have chosen a medium size Air Hockey table from a well known online seller to deploy the robot on: We wanted something easily transportable but comfortable to play with. The final dimensions of this Air Hockey table are 90x43cm. The Air Hockey Robot consist in three different parts: The Air hockey table, the Robot itself and your own smartphone. Your smartphone, running the Air Hockey Robot APP, can detect features on the playing court and make decisions according to the detected objects location and theirs trajectories (and attack/defend in consequence!). The smartphone will be the robot´s brain. Your own device can defeat you in a real game!. How it works: The smartphone´s camera (2) is looking at the playing court . The camera´s captured data is processed in real time by the smartphone. Detecting the position of the puck and the “Pusher robot” (and according to the current location of all the elements on the court), your smartphone makes decisions and commands the Robot (3) via WIFI (1). We have developed an APP to control the Air Hockey Robot. It is freely available in Google Play. The idea was to use the portable computer that you have with you (I am talking about your smartphone) to control the Robot. As the smartphone already has a good camera, why not make the most of it? The Air Hockey Robot is controlled by your smartphone! If you want to support jjRobots, you can get the OFFICIAL Air Hockey Robot EVO KIT from here. Optionally you can get everything by yourself and manufacture the jjRobots Brain Shield (info available here). We have published an ASSEMBLY GUIDE here. The FORUM is always available too for everyone who wants to share ideas and ask for help. In the Assembly guide you will find a lot of info about how to put everything together. You can use the SAME electronics, motors, cables…to create your iBoardbot, B-robot EVO or Sphere-o-Bot! It’s very easy to adjust the level of the robot, for example to play with children, go to the APP configuration menu and set the difficulty.